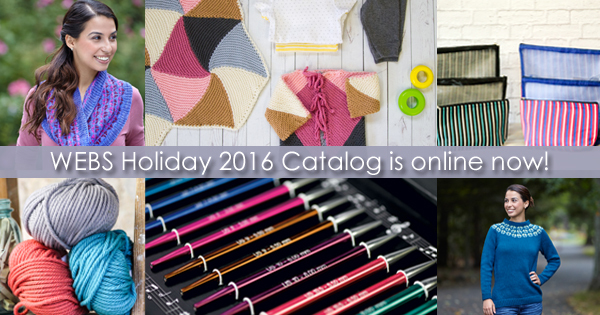 WEBS Holiday 2016 Catalog is online! It’s time to make those holiday gift making plans, if you haven’t already! 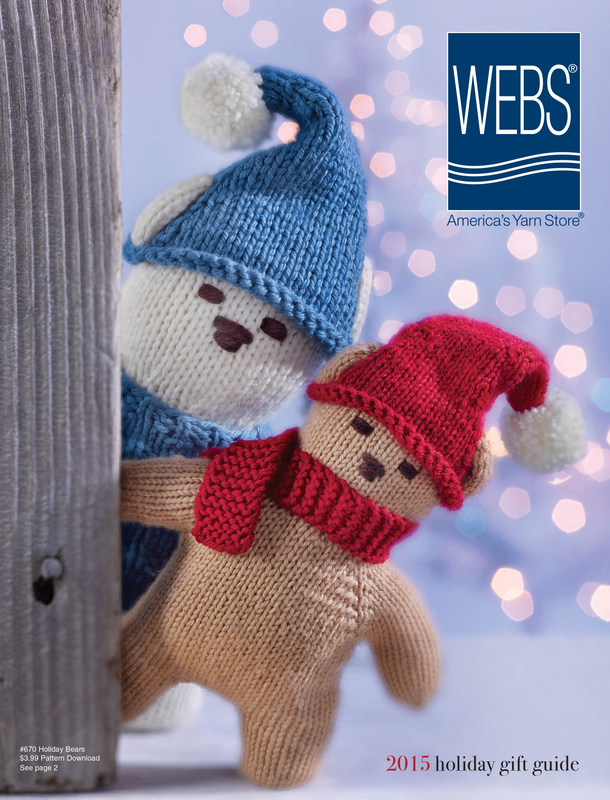 In our Holiday 2016 Catalog you will find knitting and crochet patterns, new and favorite yarns, spinning wheels and fiber, rigid heddle looms, and fantastic gift ideas for everyone in your life. Paper catalogs will begin arriving in mailboxes in the near future but feel free to browse the catalog now! If you’re not yet on the mailing list sign-up here! 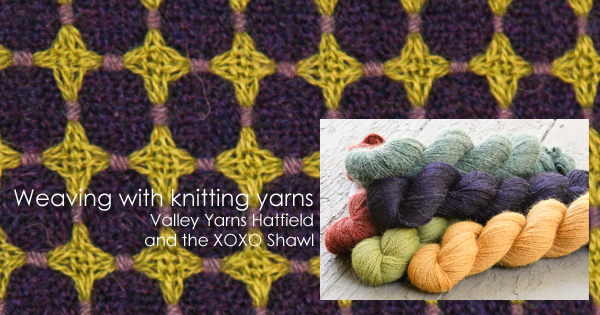 We’ve been lucky enough to add 6 incredible yarns to our family of Valley Yarns so far this year. Our Southampton is a lighter than air combination of mulberry silk and kid mohair and our Pocumtuck is a 100% cashmere at a versatile DK weight. When working her magic and dreaming up designs for our Fall ’16 catalog our Design Manager, Kirsten Hipsky wondered what would happen if she combined the two, and the Lida Pullover was born! Knit in the Putty color of Pocumtuck and the Natural color of Southampton this pullover features a large, triple cable panel with a v-neck and set-in sleeves for a luxurious knit that will have you dreaming of Fall sweater weather even in summer! Originally swatched in greens, Spring Grass and Spring Moss, this pullover would be casually stylish in blues and softly elegant in deep greys. 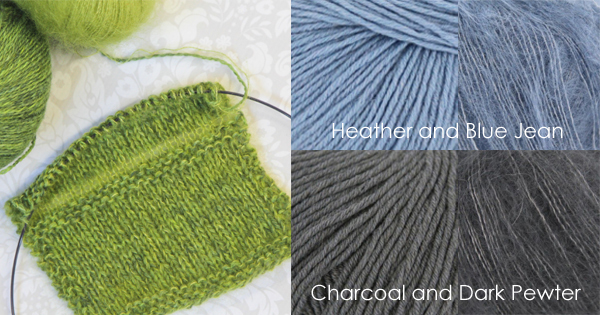 What colors of these yarns would you pair for your own Lida? 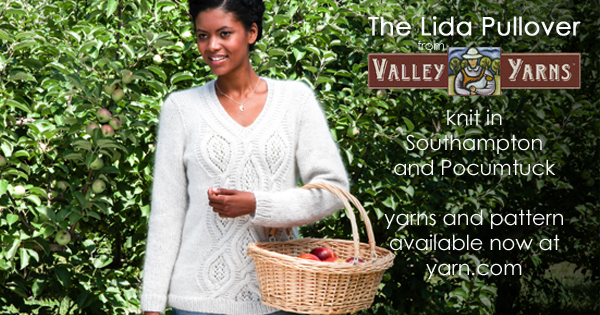 Valley Yarns 2016 Summer Catalog is here! You can browse our new summer catalog now! 3 new Valley Yarns, 22 new patterns, and almost a dozen editorials and write-ups for yarns, products we love, and a designer we’re beyond happy to feature! Get a jump on your Summer knitting now! Physical copies will be landing in mailboxes mid-month. If you’re not on it already, sign up for our mailing list and you’ll receive our Fall catalog in September. If you’re local you can pick up a copy in the store! Which new yarns and patterns are you excited about? I am often asked by weavers if they can only use coned yarns for weaving. The answer is an enthusiastic no! After all, why should crocheters and knitters get to hog all the fun colors, textures and feels of skeined yarns? Of course, there are factors that determine the suitability of yarn for warps, so be sure to evaluate your yarn first. The yarn needs to be strong enough to withstand tension as well as the abrasion of the reed moving back and forth. Hold a piece of the yarn and pull firmly. Keep in mind that the tension will be spread across the entire warp and please don’t yank, because there is no yanking in weaving. More importantly, hold the yarn taut and scrape with the side of your thumbnail. See how it behaves with abrasion – does it pull apart or fuzz out? Another characteristic to keep in mind is the stretch factor. Yarns spun for knitting/crocheting are often springy and stretchy, which is great for sweaters, but not always compatible with looms. Some of these yarns continue to stretch under tension and then spring back when taken off the loom, resulting in a very dense piece of cloth (i.e. scarf that drapes like a rug). Give your potential warp a strong pull and release to see just how elastic it is. It’s not that you can’t weave with stretchy yarns, just use enough tension to create a good shed while resisting the temptation to over tighten. And probably avoid the spandex. Weft yarns, on the other hand, are a wide open garden of creativity. Yes, the weft needs to play well with the warp in terms of intended care, shrinkage and wear. But the weft is free from the constraints of tension, abrasion and size so let your imagination run free. 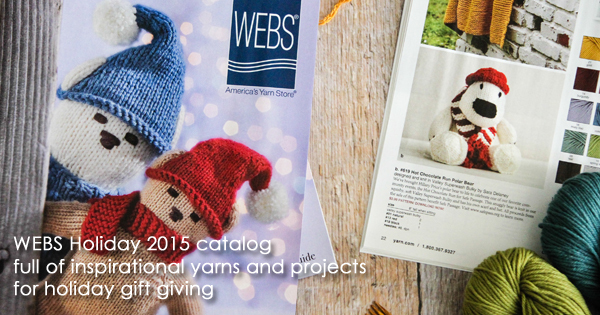 Our Weaving Sourcebook for 2016 features a few drafts using skeined yarns. The XOXO Shawl, draft 91, is woven with Hatfield an exceedingly soft laceweight baby alpaca that feels like a wearable hug. Lisa Hill designed a beautiful deflected double weave pattern that creates circles and dots of color. Each face of the cloth shows a different color emphasis, making it fun to wrap and change the look. 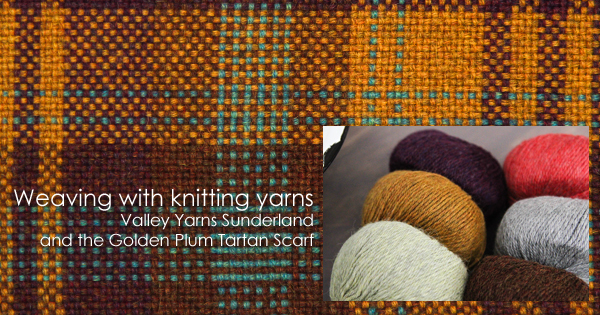 Sunderland is one of the newer yarns in our Valley Yarns collection. Also spun in 100% baby alpaca, it is a worsted weight with a palette of rich heathered tones. Paula Veleta designed the Golden Plum Tartan Scarf, Draft 99, for the rigid heddle and the gorgeous effect comes from the carefully placed lines and blocks of stunning color. Do you have a favorite skeined yarn you like for weaving? Spring is here and with it is the 2016 Weaving Sourcebook. Our annual weaving catalog is not only filled with color cards of our coned yarns – oh so helpful – but features pictures and links to our new crop of weaving drafts. This year we are especially proud of the stunning array of projects for Rigid Heddle looms. These drafts run the gamut from beautiful colorwork to textured weaves and unique finishing techniques. It’s a great time to be a rigid heddle weaver! The Textured Towel (Draft 92) uses double heddles to handle both the fine size of the 8/2 cotton as well as add great texture to make these towels really pop. Our 8/2 cotton has such a great range of colors, you can match the décor of any kitchen. I’ve got a family wedding coming up and a set of these towels will be perfect for a gift to the young couple. As many of you know, I love to make sets by varying the weft colors and this plaid design will be great for playing with stripe placement. 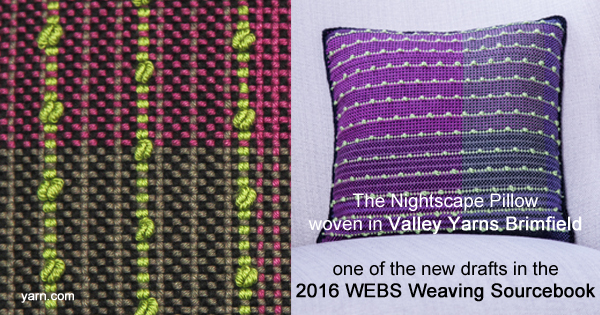 Another fun textured design is the Nightscape Pillow (Draft 98) woven with Brimfield. The decorative popcorns are created by pulling up loops across a single pick in a bright color that makes it really pop. The background stripes are in plain weave with a syncopated color order that keeps things lively. Brimfield is one of our newer yarns and is soft and squishy with a color palette that continues to expand. We round out the hand manipulated drafts with the Comfy Couch Throw (Draft 100) made with the supersoft Superwash DK in both solid and hand dyed colors. The unique construction of the throw is set up in the warp, where some slots are left empty. This creates channels of weft floats in the middle of the cloth and loops along the edges. The panel is woven in two pieces which are then joined together by pulling the edge loops through each other to form a decorative seam and finished selvedges. Surface texture is added by using the weft floats to anchor crochet chains in a color pattern of choice. So celebrate your rigid heddle loom and add some new techniques to your weaving vocabulary! What is your favorite thing to weave on your rigid heddle loom? 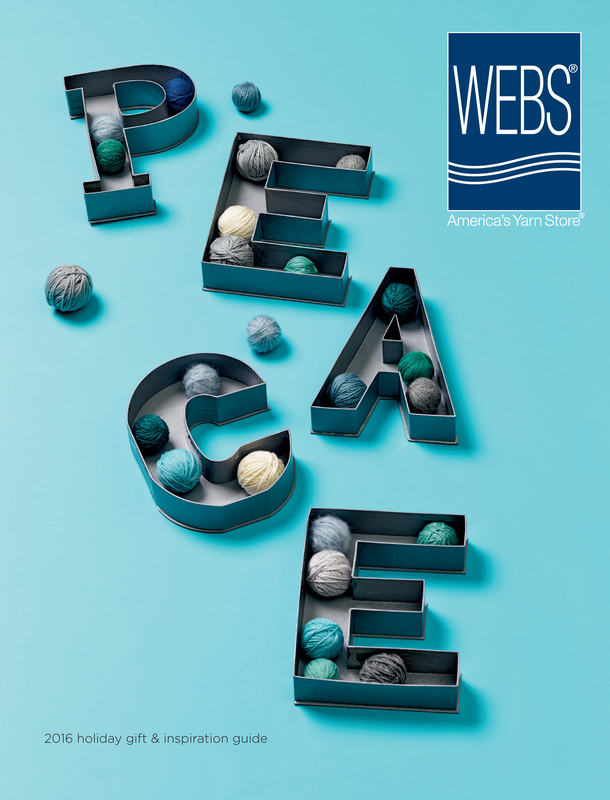 Each year we work behind the scenes to bring you a weaving catalog chock full of new and exciting products and this year we’ve outdone ourselves! Flip through the new Weaving Sourcebook now! In these pages you will find new yarns, like our Hatfield and Sunderland, both 100% Baby Alpaca, or our 6/2 Cotton in 29 stunning colors! Our new favorite tool is the Swatch Maker from Purl & Loop. Plan out your next weaving project with confidence! And speaking of next projects, we have 18 Brand New drafts for you in this catalog with 6 that are perfect for Rigid Heddle! 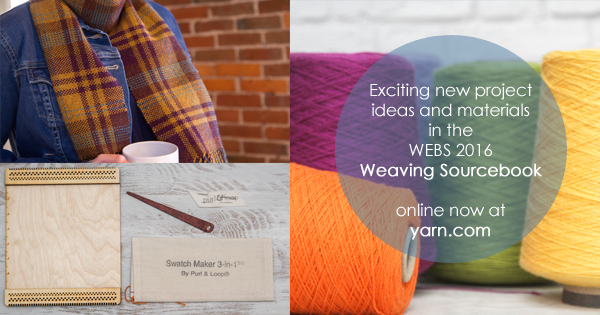 What exciting weaving projects will you create in 2016? Join our email list now to make sure you don’t miss out on any great deals, and if you don’t already receive a copy of our catalog you can request one here. 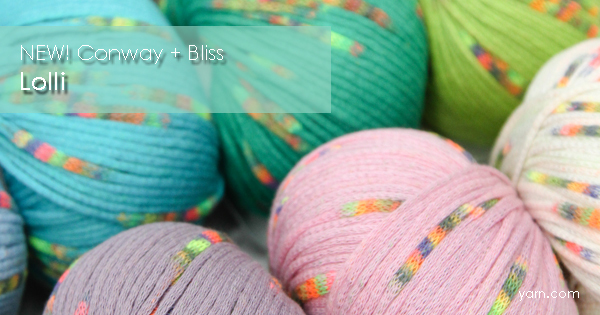 New Yarns from Debbie Bliss! Baby Cashmerino has long been one of my go-to yarns when I want to enjoy my knitting as much as the finished baby garments. 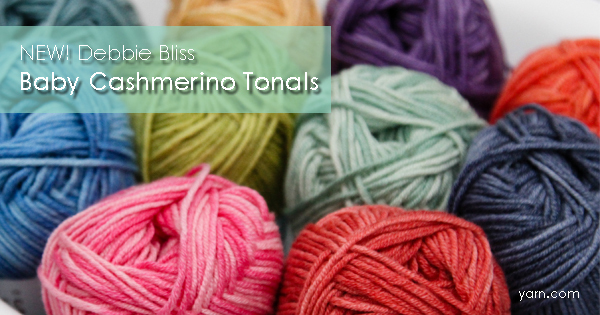 This Spring Debbie Bliss has introduced Baby Cashmerino Tonals and I’m thrilled by the possibilities of combining these colors with some of my favorite solids. Never one to disappoint, Debbie Bliss has released a full pattern collection of tiny sweaters perfect for the little one in your life, and this yarn! 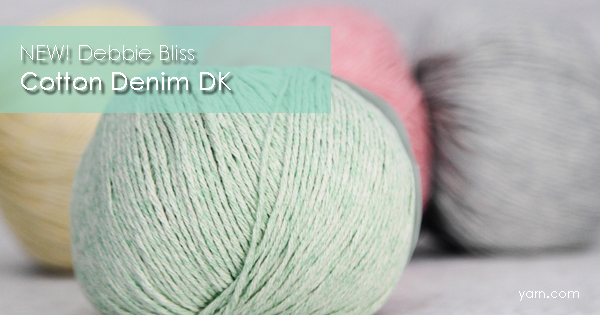 If you’re looking to knit for yourself this spring try the new Cotton Denim DK. Not only is it a machine washable, 100% cotton, but it’s available in almost a dozen soft, summer shades. I have my eye on the several of the patterns from the accompanying collection. 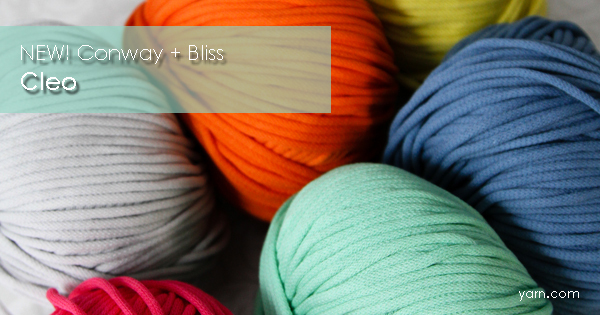 And for a little fun in your wardrobe try the two new yarns from Conway + Bliss! A soft chainette tube, Cleo feels like t-shirt material! This will make terrific warm-weather garments and accessories in bright, solid colors. 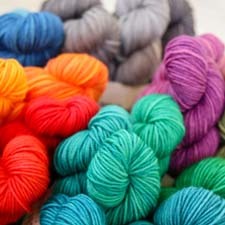 Lolli is another chainette-type yarn in bright, solid hues, but with surprise bursts of color throughout! This one will knit up into fun hats, scarves, cowls or other accessories, and there’s great pattern support for both. 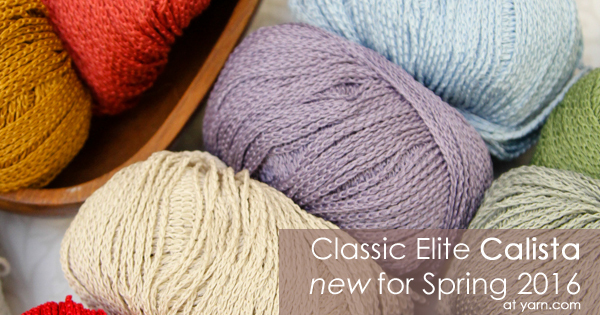 You can read more about these yarns and see lots of pattern ideas in our new Spring 2016 Catalog. 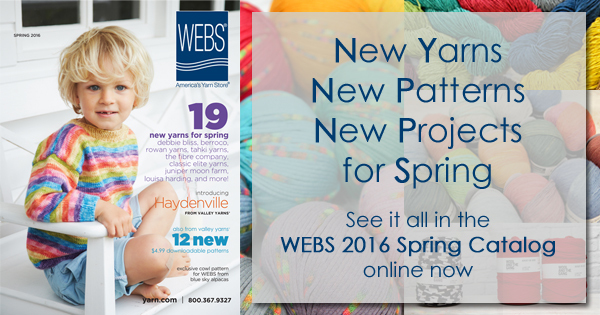 WEBS Spring 2016 Catalog is online! While it’s been a fairly mild winter , compared with 2015, but I’m still ready to start thinking about camping, beach days and cool summer evenings. So the timing of the WEBS 2016 Spring Catalog couldn’t be more perfect! There are so many great, new yarns and patterns in our Spring catalog that I’m going to need a few days to decide on what to cast on for first. The Odele pullover in Berroco Mykonos, the Tobay top in Tahki Yarns Malibu, or the Diamond Lace Sweater in Debbie Bliss Cotton Denim DK? And that’s just scratching the surface! If you’re on our mailing list a copy should land in your mailbox in the next week or two, and if you’re not, sign up here!